For those who haven’t learned how to hand-reload ammunition yet, one of the easiest and cheapest possible ways is the Classic Lee Loader. Available for less than $40, it eliminates the “cost of getting started” concern completely, because you’ll likely recoup your entire starting cost within your first 2 or 3 boxes of handgun or rifle cartridges. Further, it is extremely compact, even amenable to a bug-out bag. Once you learn how to reload, you are no longer dependent on politically-challenged national supplies of ammunition. Storing components, rather than assembled cartridges is also far less bulky. The makings of thousands of rounds can be stored easily on half a single bookshelf. I suggest that a great starting point would be handloading 38 Special. Inexpensive 50-round boxes of that caliber at the local discount big-box store are currently $18, but you can easily reload an entire box for under $8. This article will serve mainly to dispel inaccurate fears and concerns and point you in the proper directions to get started. After all, talk is cheap, DOING is what counts, right? It will take you far longer to READ this article that it actually takes to RELOAD several rounds, once you get the hang of it. 38 Special is chosen for a strategic reason: you don’t need mechanical calipers to properly set the depth of bullet insertion, because the cast lead semi-wad-cutters (SWC) projectiles you will use already include a crimp indentation that marks your correct bullet seating for you. When you move to doing taper-crimped pistol or rifle rounds, you’ll want to acquire a simple mechanical or digital caliper; these can be purchased for less than $10 at Harbor Freight. First, acquire a source of 38 Special brass (not aluminum or steel) cases. You can use ones you’ve fired; you can pick them up at the range, or you can buy new or once-fired empty brass cases. I get mine for free either at the range (newbie firearm owners often don’t realize the value of their brass!) or from my own cartridges; with a revolver, this is especially easy, of course. Discard any that have cracks or odd bulges or other mechanical defects. Cases can generally be re-used until there is any crack, or the primer pocket becomes enlarged and primers go in “too easily”. Other than cleaning off all dirt/sand, it is not really necessary to shine or clean the cases at all. 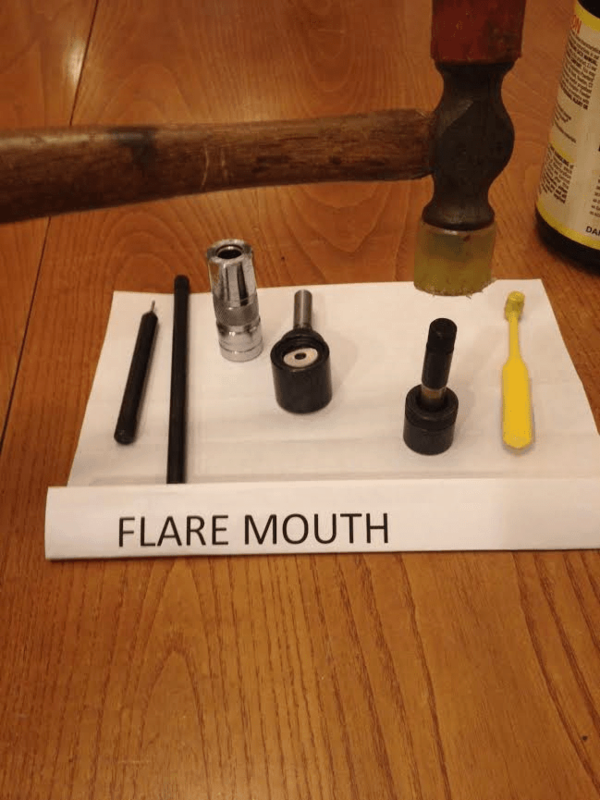 Second, purchase your reloading tools. I’m listing MidwayUSA products, but you can purchase from anyone. You’ll need the Classic Lee Loader in 38 Special  about $30, a complete set of Lee “dippers”  $11 and one tube of Lee case lube  $4.19. Third, you must acquire your “consumables” for your newly created rounds: primer, powder, and projectiles. Here are my suggestions: Primers and powder can be purchased via the internet (I often use www.powdervalleyinc.com) , but they require a “Hazmat” fee, so either combine orders with some buddies and split the Hazmat fee, or buy locally either one primer cassette (100) or one box (1000) of primers, from a firearms dealer. For 38 Special, you must use SMALL PISTOL primers, of any manufacturer (I have used Winchester, CCI, and others). Expect to pay approximately 3-4 cents each primer. 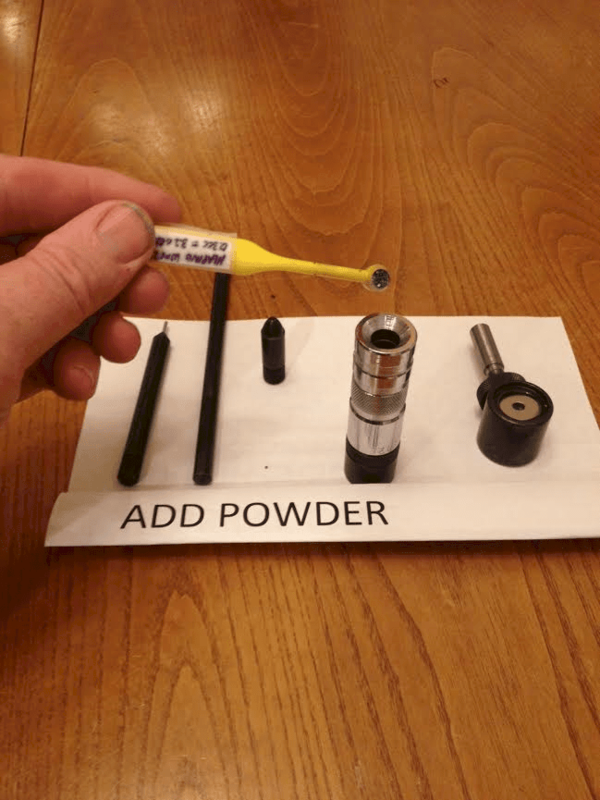 One pound of most pistol powder will make approximately 1800+ loaded cartridges, so if you can buy one pound of Win231 or HP-38 (they are identical, and the instructions below are SPECIFIC for this exact powder) locally for under $30 that solves your problem; otherwise, I suggest you find a reloader near you and persuade him/her to sell you 1/10 lb. in a proper DOT-approved smokeless-powder container – it is likely your source still has “empties”. (Try posting a note at your target range, reloaders usually are helpful.) BE CERTAIN your container is properly & permanently marked with the proper powder designation; it is best if it is an original DOT-approved Win231/HP-38 container. Finally, purchase projectiles (“bullets”) : for the instructions that follow, you must use 158 grain lead semi-wad-cutter (“SWC”) .358” diameter cast bullets (the weight is very important!) and I suggest Missouri Bullet Company “.38 Match”  at $35/500 = 7 cents each. Your total consumables price per cartridge thus includes primer 4 cents, powder < 2 cents, projectile 9 cents or so with shipping; the total is 15 cents per round, or $7.50 per box. That is almost 60% OFF the normal price of inexpensive target 38 Special in my area! And once you have your stocks in place, you are no longer dependent on retail stores to have ammo on hand, ever again. Other than using a bit of your time (providing exercise! ), there is only one real disadvantage of the Classic Lee Loader, and that is that every once in a while you are going to have a primer go off. It is loud, similar to a balloon bursting while being filled, but the design of the Classic Lee Loader is such that it is not dangerous. You insert the primer in such a fashion that there is a big chunk of metal between you and the primer and very little way for anything to get to you, and your fingers aren’t anywhere they could get hurt either. I’ve loaded hundreds of rounds with a Classic Lee Loader and only had a couple primers ever go off, so dismiss this fear and move on. If you are nervous, wear ear protection. You SHOULD wear eye protection when reloading. It can happen even with a big fancy press also. The Lee instructions are CONCISE –every word and sentence is there for a reason. As a new reloader, never deviate from their instructions. In the following, I’m going to walk you through some of their instructions to explain a few points. You need a non-metallic hammer. You can use a rubber or plastic mallet, you can use a 2×2 piece of wood, some PVC; you can even use a tree branch. It just can’t be a steel hammer. Improvise if necessary! 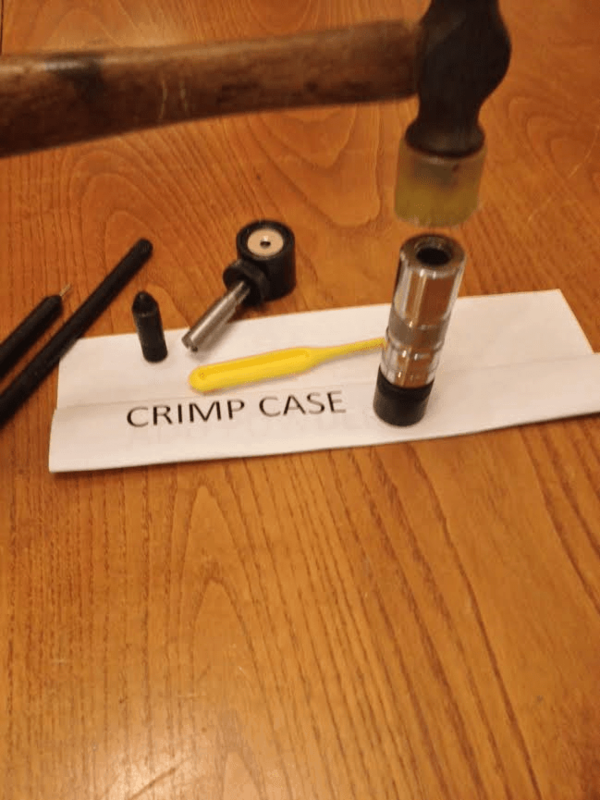 Before starting, review the parts that come with your kit to become familiar: priming chamber (which is also the bullet seater, with a locknut); decapper rod, priming rod, Body (the “die” which not only sizes, but also crimps on the opposite end), flaring tool, decapping chamber, and the famous yellow dipper powder measure. The first step is removing the old primer, which you simply punch out using the decapper rod inside the case, with the case sitting on the decapping chamber, which has a convenient hole in the bottom to allow the primer to pop out. The second step is sizing. 38 Special is straightforward: using the mallet, you just drive the case, mouth first, into the die tool–the end of the die tool that has a slight cutout for the rim, not the side with the obvious flare/funnel-shape. However, depending on tolerances, this may be TIGHT, and you may want to put a very thin coating of Lee lube on the outside, using a fingertip, to make this easier (and easier to get back out!). Although the photos show this on my kitchen table, I actually had to do this on a concrete floor, and even then I was about 1/32″ short of getting it flush (the goal). Regardless, it was plenty good enough; the finished rounds fit fine into a revolver (the ultimate goal). I picked this caliber in part because such sized cases are very likely to function well because they usually go into a revolver. On a normal press, you have enormous leverage to make sizing much easier, but when you get to 50 cal, it still can take considerable muscle. A side note: Rifle bottle-neck Classic Lee Loaders size only the “neck” (where the bullet is gripped), and as such can’t reliably make ammunition for semi-automatic rifles which require the precise reshaping of the body of the case. They are not the choice for semi-auto pistols, either. They DO make great bolt-action and revolver ammo–thus you start with 38 Special! The “fun” step is next: priming! The priming chamber has a spring-loaded large flat washer that allows the case to move downward, whereas the new primer sits on a central plateau that holds it still as the case envelopes it. Insert the primer into the center hole of the priming chamber stage, set the die with the still-embedded case on top, insert the priming rod (dimpled end down) and tap the case downward onto the primer. Keep your face away (eye protection, right?). Note what you are tapping is the CASE, not the primer! This will possibly take several substantial whacks, again on a concrete or sturdy support. The system pretty much prevents you from over-inserting. You will feel the case slip over the primer, and then it will stop moving after several whacks– you are done. Before proceeding, feel the primer in the case head with your fingertip. The primer MUST be flush (or slightly depressed). If it is “proud”, it is under-inserted and it could jam your revolver, so you have to CAREFULLY set it back into the locator ring and give it another tap. If your cases are all tight here, try using a primer reamer tool or a cleaner tool (even a small screwdriver) to scrape out any obstructions. If you run up on a case where you simply can’t get the primer flush–throw it into the trash. Once you add the powder in a step below, you can NEVER try to advance the primer any farther….the results would possibly be powerful. Now you place the die tool, with the embedded primed & sized case on top of the decapping chamber you started with, and tap it gently to extract the case; leave it sitting in the decapping chamber. Lead pistol bullets require “flaring” of the brass case mouth, or they will be unable to insert into the case without shaving off the lead, so tap the flaring tool into the case mouth. It has a “stop” built in. Replace the die tool back over the case, still sitting in the decapping chamber. The funnel top helps you add the powder in the next step. The 38 Special was originally designed for less-potent (but explosive!) black powder, so the few grains of modern smokeless powder required will merely cover the bottom of the case. It still works fine – but be VERY careful not to add additional powder beyond the recommendation, and also never FORGET to add powder at all. The “official” load data that apply for Lead semi-wad-cutter bullets is 3.1 (minimum) – 3.7 (maximum) grains of either Win231 or HP-38 powder. (Jacketed rounds can have a tiny bit more powder, up to 4.3 grains.) Changing anything at all about the bullet changes the peak pressure achieved, and we are talking about BIG PRESSURES in the range of 15,000 pounds per square inch, so no creative thinking allowed here – stay well within the carefully proven safe recipes. Extra powder, too-deeply inserted bullet, heavier bullet – all these make higher pressure. Too little (or no!) powder and you could “stick” a bullet in the barrel, causing the next bullet to destroy the firearm. It is safe to go right down to the minimum but approach the maximum carefully. A digital powder scale is less than $30 if you have any doubts. (I like the MTM product.) Unfortunately, the “dipper” supplied with the Lee 38 Special kit is 0.5 cc, appropriate for some other powders that I don’t use. For Win231/HP-38 you need the Lee 0.3 cc dipper, and the only way to get it is to buy their “dipper kit” ($11) listed above. Published specs and my own confirmation shows that if you dip the 0.3cc dipper into Win231/HP-38 powder and fill it level to the very top (without packing or mounding), you will have 3.2 grains, which is a perfectly safe amount of powder (exactly ONE scoop) — pour it into the case and you are done. When you first buy the dipper, use a q-tip to massage a little lock-graphite (you can sand a pencil lead to get some) into and on the outside of the cup to avoid static electricity clumping up your powder. NEVER put more than one level scoop of Win231/HP-38 into the case. (When you get more advanced, using an accurate powder scale & thrower, you can experiment with somewhat stiffer charges, but not now.) A possible load (that I have no experience with) using Alliant Unique is discussed in . With the case still partially in the die and protruding down to rest in the decapping chamber (which means the primer is over the hole and touching NOTHING), drop your projectile backward down into the mouth of the case. Adjust the stop-collar to shorten the “handle” of the primer chamber/bullet seater, slide it down to rest on the front of the bullet and gently tap the priming chamber until it’s lock collar bottoms out on the die tool (this does not take much force at all). Now remove the round and see if your bullet properly seated down to the crimp indent which is just forward of the blue lubrication ring; if it went too far in, discard that round, shorten your handle some more and try again; if it didn’t insert the bullet quite far enough, lengthen the handle a bit, re-setup the system and tap it in a bit farther until you get the die-tool collar properly set. At that point accurately tighten the lock collar so your next rounds will quickly seat right to the proper spot. The “funnel” side of the die tool is set to put a roll crimp on the mouth of the case. With the cartridge still safely sitting in the decapping chamber (so that primer is over the hole and therefore touching nothing! ), set the funnel side of the die tool over the forward end of the cartridge and tap it home (not much effort) with your mallet. Remove the finished cartridge and you should see a nice roll crimp into the bullet indent, and the blue lube ring now hidden. Functional evaluation: The primer should be flush, the crimp should roll nicely into the indentation on the bullet, the cartridge should look like a commercial one, and should slide easily right into your revolver (when you get to the range). These will definitely not be “+P” rounds, but they will exit the barrel and do significant damage to whatever they impact. Once you have the hang of it, reloading is relatively quick and easy even on the labor-intensive Classic Lee Loader. There is a Youtube video showing Richard Lee, the inventor, reloading a rifle case in 40 seconds. If you upgrade in the future to a standard press, your production rate will increase substantially. But you’ll always remember fondly your days of “whack-a-mole” reloading with the Classic Lee Loader. Alliant Unique: I have NOT tried this, but the maximum load for Speer 158 LSWC bullet with a cartridge overall length of AT LEAST 1.44″ given at alliantpowder.com, is 4.7 grains; the (approximate) volumetric data for Alliant Unique given at http://leeprecision.com/cgi-data/instruct/AP1704.pdf is 0.1092 cc/grain, and multiplying gives a maximum charge volume of 0.51 cc, suggesting that just-quite-level 0.5cc Lee dipper would be a safe load. I cannot take an responsibility, however, since I haven’t tested this. Great little tool but, just remember They are not made for loading semi-auto rifle rounds. Lee made the case die to neck size ( bolt action hunting rifles) only, not full length. I realize you are pushing cost as a way to get into reloading but I think this style of hand loader is more for someone with experience rather than the beginner, I would recommend the Lee breach loader kit, yes it costs a bit more at about $100 but you get nearly all you need to get started except dies which run from around $35 to about $50 and a few cheap items for cleaning and trimming cases, then you just buy different dies for each caliber you want to load, a tumbler can be purchased at Harbor Freight for about $50, I started reloading over 40 years ago and after having to stop for a few years and starting again about 10 years ago the Lee single stage breach loader set is what I bought, I load anywhere from 500 to a 1000 rounds at a time and have loaded many thousands of rounds with this setup, it will handle from the smallest round and up the largest I reload is the 30-06.